The 2017 Green Bay Packers season was their 99th season overall, 97th season in the National Football League, and the 12th under head coach Mike McCarthy. After reaching the NFC Championship Game in the previous season, the Packers failed to improve a 10–6 record from 2016 and were eliminated from postseason contention after Week 15, making this the first time since 2008 that they failed to make the playoffs. After a 4-1 start, the Packers lost starting quarterback Aaron Rodgers to a collarbone injury during the week 6 game against the Minnesota Vikings, and went on to lose 8 of the 11 remaining games. A loss to the Lions in week 17 secured the Packers’ first losing season since 2008. The Packers' opponents in this season were almost identical to that of their 2005 season in which the team finished 4-12; this season the Packers faced the Seattle Seahawks, and teams from the NFC South & AFC North. The lone difference between these two seasons was that the team faced the Dallas Cowboys, replacing the Philadelphia Eagles, as the Cowboys won the NFC East in 2016. The Packers received one compensatory selection — No. 182 overall. Green Bay traded their first-round selection (29th) to Cleveland in exchange for Cleveland's second- and fourth-round selections (33rd and 108th). Green Bay traded their fifth-round selection (172nd) to Denver in exchange for Denver's fifth- and seventh-round selections (175th and 238th). Secondary (Cornerbacks) – Joe Whitt Jr.
LA Rams and Washington was 5–0, compared to Minnesota's 4–1 cumulative record against the same four teams. ^ a b LA Rams claimed the No. 3 seed over New Orleans based on head-to-head victory. ^ a b New Orleans clinched the NFC South division over Carolina based on head-to-head sweep. ^ a b c Detroit finished ahead of Dallas and Seattle based on conference record, while Seattle finished ahead of Dallas based on head-to-head victory. was 2–3, compared to Washington's 1–4 cumulative record against the same four teams. ^ a b Tampa Bay finished ahead of Chicago based on head-to-head victory. The Packers' preliminary preseason schedule was announced on April 10. The Packers' preliminary regular season schedule was announced on April 20. SEA – Blair Walsh 33-yard field goal, 0:04. Seahawks 3–0. Drive: 8 plays, 74 yards, 0:55. GB – Ty Montgomery 6-yard run (Mason Crosby kick), 10:39. Packers 7–3. Drive: 1 play, 6 yards, 0:06. SEA – Blair Walsh 21-yard field goal, 4:23. Packers 7–6. Drive: 11 plays, 71 yards, 6:13. GB – Jordy Nelson 32-yard pass from Aaron Rodgers (Mason Crosby kick), 0:22. Packers 14–6. Drive: 9 plays, 75 yards, 4:03. GB – Mason Crosby 40-yard field goal, 8:05. Packers 17–6. Drive: 12 plays, 53 yards, 5:37. SEA – Blair Walsh 41-yard field goal, 6:21. Packers 17–9. Drive: 7 plays, 52 yards, 1:44. The Packers' offense struggled for the first half against the Seahawks. On the Packers' first drive, Aaron Rodgers threw an interception that was returned for a touchdown, but an illegal block in the back penalty negated the score. Before that play Rodgers had gone his previous 251 regular season pass attempts without an interception, a career high. The Packers' defense held Seattle in check but trailed 3–0 at halftime. In the third quarter, Mike Daniels forced a fumble that Green Bay recovered at the Seattle 6-yard line, and Ty Montgomery ran in for a touchdown on the following play, giving the Packers a lead they wouldn't relinquish after that. Later Rodgers caught the Seahawks with 12 men on the field and capitalized on the free play by throwing a 32-yard touchdown to Jordy Nelson. The Packers only surrendered two field goals to Seattle for the rest of the game, giving a strong defensive showing in the season opener. ATL – Devonta Freeman 1-yard run (Matt Bryant kick), 9:55. Falcons 7–0. Drive: 7 plays, 86 yards, 5:09. GB – Ty Montgomery 1-yard run (Mason Crosby kick), 3:47. Tied 7–7. Drive: 11 plays, 75 yards, 6:08. ATL – Devonta Freeman 2-yard run (Matt Bryant kick), 11:14. Falcons 14–7. Drive: 10 plays, 87 yards, 4:12. ATL – Matt Bryant 51-yard field goal, 3:27. Falcons 17–7. Drive: 7 plays, 58 yards, 3:53. ATL – Tevin Coleman 3-yard pass from Matt Ryan (Matt Bryant kick), 0:24. Falcons 24–7. Drive: 4 plays, 36 yards, 0:28. ATL – Desmond Trufant fumble recovery 15-yard run, 14:17. Falcons 31–7. GB – Mason Crosby 28-yard field goal, 9:37. Falcons 31–10. Drive: 11 plays, 65 yards, 4:31. ATL – Matt Bryant 53-yard field goal, 4:25. Falcons 34–10. Drive: 10 plays, 40 yards, 5:14. GB – Davante Adams 33-yard pass from Aaron Rodgers, 12:50. Falcons 34–16. Drive: 13 plays, 75 yards, 6:37. GB – Ty Montgomery 1-yard pass from Aaron Rodgers (Mason Crosby kick), 5:54. Falcons 34–23. Drive: 8 plays, 85 yards, 3:44. In a rematch of the 2017 NFC Championship game earlier that year, the Falcons defeated the Packers to open up their new stadium. The teams exchanged opening drive touchdowns, but with both starting tackles out of the game due to injury, the Packers' offense failed to keep pace. At the end of the first half, with the score 17–7, a 36-yard pass to Randall Cobb was called back due to a controversial Offensive Pass Interference call on tight end Martellus Bennet. On the ensuing play Aaron Rodgers threw an interception to Desmond Trufant that lead to a Falcons touchdown, making the score 24–7 at halftime. Aaron Rodgers fumbled on the Packers' first drive of the second half, leading to another Falcons' touchdown. Though the Packers would score two touchdowns in the fourth quarter, the Falcons still prevailed, 34–23. On a one-yard pass to Ty Montgomery late in the fourth quarter, Aaron Rodgers recorded his 300th career touchdown. He is the fastest quarterback in NFL history to reach the milestone, needing only 4,742 attempts. CIN – A. J. Green 10-yard pass from Andy Dalton (Randy Bullock kick), 9:40. Bengals 7–0. Drive: 10 plays, 79 yards, 5:20. GB – Lance Kendricks 1-yard pass from Aaron Rodgers (Mason Crosby kick), 7:51. Tied 7–7. Drive: 6 plays, 60 yards, 1:54. CIN – Giovani Bernard 6-yard pass from Andy Dalton (Randy Bullock kick), 12:35. Bengals 14–7. Drive: 9 plays, 60 yards, 4:49. CIN – William Jackson III 75-yard interception run, 12:35. Bengals 21–7. GB – Jordy Nelson 1-yard pass from Aaron Rodgers (Mason Crosby kick), 10:00. Bengals 21–14. Drive: 8 plays, 75 yards, 5:06. GB – Mason Crosby 28-yard field goal, 14:47. Bengals 21–17. Drive: 8 plays, 52 yards, 2:58. CIN – Randy Bullock 46-yard field goal, 3:51. Bengals 24–17. Drive: 11 plays, 63 yards, 5:57. GB – Jordy Nelson 3-yard pass from Aaron Rodgers (Mason Crosby kick), 0:21. Tied 24–24. Drive: 12 plays, 75 yards, 3:29. GB – Mason Crosby 27-yard field goal, 6:26. Packers 27–24. Drive: 5 plays, 70 yards, 1:17. Although the Bengals entered the game 0–2 without scoring an offensive touchdown, the Packers fell behind early once again, 21–7, with one of the Bengal scores being an interception of Aaron Rodgers returned for the touchdown, which was only the second time in Rodgers career that he'd given up an interception for a touchdown. The Packers were able to rally back, tying the game with 21 seconds left in the game on a pinpoint 3-yard touchdown pass from Rodgers to Jordy Nelson. After forcing Cincinnati to punt on the opening drive in overtime, the Packers found themselves in a 3rd and 10 situation but Aaron Rodgers managed to draw the Bengals offsides, allowing for a free play that resulted in a Geronimo Allison 72-yard catch to the Cincinnati 8-yard line. Mason Crosby then kicked the winning field goal, giving Aaron Rodgers his first ever overtime win, after having gone 0–7 for his career in overtime games, which included the playoffs. This also gave Rodgers his first win over the Bengals, giving him a win over every NFL team but the Packers (including the playoffs). GB – Davante Adams 5-yard pass from Aaron Rodgers (Mason Crosby kick), 9:49. Packers 7–0. Drive: 10 plays, 75 yards, 5:11. GB – Randall Cobb 2-yard pass from Aaron Rodgers (Mason Crosby kick), 8:59. Packers 14–0. Drive: 3 plays, 3 yards, 0:45. GB – Aaron Jones 2-yard run (Mason Crosby kick), 4:52. Packers 21–0. Drive: 2 plays, 60 yards, 0:40. CHI – Kendall Wright 5-yard pass from Mike Glennon (Connor Barth kick), 0:12. Packers 21–7. Drive: 7 plays, 72 yards, 1:33. GB – Jordy Nelson 4-yard pass from Aaron Rodgers (Mason Crosby kick), 4:13. Packers 28–7. Drive: 13 plays, 63 yards, 4:09. GB – Jordy Nelson 8-yard pass from Aaron Rodgers (Mason Crosby kick), 15:00. Packers 35–7. Drive: 6 plays, 42 yards, 2:51. CHI – Jordan Howard 3-yard run (Connor Barth kick), 6:06. Packers 35–14. Drive: 15 plays, 75 yards, 8:53. In the 195th meeting between the Packers and Bears, the Packers took advantage early, scoring first on their opening drive, then scoring less than a minute later after recovering a Bear fumble. Taking advantage of several Chicago miscues, including three turnovers and a missed field goal, the Packers rolled to a convincing win over their rivals, with Aaron Rodgers throwing four touchdown passes. The victory also gave the Packers a 95–94–6 edge in the rivalry with the Bears, the first time the Packers had the lead in the rivalry since 1933. In the third quarter wide receiver Davante Adams took a vicious and illegal hit from Bears linebacker Danny Trevathan that required a stretcher to take Adams off the field. Adams was diagnosed with a concussion and immediately taken to the hospital, where he spent the night. He did not have any significant nerve damage and would return for next Sunday's game against the Dallas Cowboys. DAL – Cole Beasley 2-yard pass from Dak Prescott (Dan Bailey kick), 8:26. Cowboys 7–0. Drive: 12 plays, 75 yards, 6:36. GB – Davante Adams 10-yard pass from Aaron Rodgers, 4:05. Cowboys 7–6. Drive: 8 plays, 75 yards, 4:23. DAL – Cole Beasley 5-yard pass from Dak Prescott (Dan Bailey kick), 13:41. Cowboys 14–6. Drive: 11 plays, 75 yards, 5:24. DAL – Dez Bryant 10-yard pass from Dak Prescott (Dan Bailey kick), 6:16. Cowboys 21–6. Drive: 10 plays, 57 yards, 5:56. GB – Aaron Jones 7-yard run, 0:58. Cowboys 21–12. Drive: 13 plays, 75 yards, 5:16. GB – Mason Crosby 22-yard field goal, 11:12. Cowboys 21–15. Drive: 9 plays, 71 yards, 3:51. GB – Jordy Nelson 10-yard pass from Aaron Rodgers (Mason Crosby kick), 15:00. Packers 22–21. Drive: 14 plays, 88 yards, 7:43. DAL – Dan Bailey 43-yard field goal, 11:49. Cowboys 24–22. Drive: 8 plays, 50 yards, 3:09. GB – Damarious Randall 21-yard interception return, 10:04. Packers 28–24. DAL – Dak Prescott 11-yard run, 1:13. Cowboys 31–28. Drive: 17 plays, 79 yards, 8:43. GB – Davante Adams 12-yard pass from Aaron Rodgers (Mason Crosby kick), 0:11. Packers 35–31. Drive: 9 plays, 75 yards, 1:02. In a rematch of the Divisional playoff game from the previous season, the Cowboys took an early 21–6 lead over the Packers, before the Packers rallied to pull themselves within six points at the end of the third quarter. In the fourth quarter, the lead changed hands four times, with the Packers getting the last push. With just over a minute left, Aaron Rodgers led a drive that was capped off by a 12-yard touchdown pass to Davante Adams with eleven seconds left in the game, giving the Packers their third win in a row. Rookie running back Aaron Jones also had his first 100-yard game of his NFL game, as well as the first for any running back on the Packers for the season. MIN – Jerick McKinnon 27-yard pass from Case Keenum (Kai Forbath kick), 15:00. Vikings 7–0. Drive: 2 plays, 42 yards, 0:11. GB – Davante Adams 14-yard pass from Brett Hundley (Mason Crosby kick), 10:47. Tied 7–7. Drive: 3 plays, 18 yards, 1:24. MIN – Jerick McKinnon 3-yard run (Kai Forbath kick), 7:26. Vikings 14–7. Drive: 8 play, 84 yards, 3:18. GB – Mason Crosby 26-yard field goal, 1:53. Vikings 14–10. Drive: 7 plays, 30 yards, 2:11. MIN – Kai Forbath 36-yard field goal, 9:39. Vikings 17–10. Drive: 12 plays, 57 yards, 5:25. MIN – Kai Forbath 34-yard field goal, 15:00. Vikings 20–10. Drive: 11 plays, 66 yards, 5:16. MIN – Kai Forbath 53-yard field goal, 10:52. Vikings 23–10. Drive: 4 plays, 0 yards, 1:29. The Packers lost Aaron Rodgers to a shoulder injury early in the game after he took a big hit from Minnesota linebacker Anthony Barr. It was later revealed that he suffered a broken right collarbone and the injury could end his 2017 season. Brett Hundley threw one touchdown, but also threw three costly interceptions, in relief of Rodgers as the Packers took a 23–10 loss. After the game, Mike McCarthy announced that due to Rodgers' injury, Hundley will be given the starting quarterback position "indefinitely." GB – Aaron Jones 46-yard run (Mason Crosby kick), 13:09. Packers 7–0. Drive: 5 plays, 75 yards, 2:00. NO – Mark Ingram Jr. 12-yard run (Wil Lutz kick), 12:35. Tied 7–7. Drive: 7 plays, 53 yards, 3:13. GB – Brett Hundley 14-yard run (Mason Crosby kick), 08:45. Packers 14–7. Drive: 8 plays, 75 yards, 3:54. NO – Brandon Coleman 22-yard pass from Drew Brees, 11:29. Packers 14–13. Drive: 7 plays, 59 yards, 3:36. NO – Wil Lutz 28-yard field goal, 4:12. Saints 16–14. Drive: 10 plays, 74 yards, 4:40. GB – Mason Crosby 46-yard field goal, 14:50. Packers 17–16. Drive: 10 plays, 53 yards, 4:18. NO – Wil Lutz 44-yard field goal, 10:26. Saints 19–17. Drive: 9 plays, 60 yards, 4:29. NO – Drew Brees 1-yard run (Wil Lutz kick), 4:57. Saints 26–17. Drive: 8 plays, 55 yards, 3:30. In his first career start, Brett Hundley took a conservative approach and completed 12 of 25 passes for only 87 yards, adding an interception without any passing touchdowns. Rookie Aaron Jones rushed for 131 yards on 17 carries and a touchdown, his second 100-yard game in three career starts. Two first half interceptions from Drew Brees helped the Packers maintain a 14–7 lead at halftime, but the Saints came out of the half scoring 9 points on their first two drives to take a 16–14 lead. After the two teams exchanged field goals, the Saints took the lead for good on an 8-play, 55 yard drive that ended with a 1-yard touchdown rush from Drew Brees. Green Bay's comeback effort was thwarted when Brett Hundley threw an interception to safety Kenny Vaccaro on the ensuing drive. The win marked the Saints' fourth consecutive victory after starting the season 0–2. No game. Green Bay had a bye week. DET – Marvin Jones 25-yard pass from Matthew Stafford (Matt Prater kick), 1:50. Lions 7–0. Drive: 9 plays, 71 yards, 4:59. DET – Ameer Abdullah 4-yard run (Matt Prater kick), 2:53. Lions 14–0. Drive: 13 plays, 91 yards, 6:50. GB – Mason Crosby 35-yard field goal, 0:02. Lions 14–3. Drive: 12 plays, 68 yards, 2:47. DET – Matt Prater 44-yard field goal, 9:10. Lions 17–3. Drive: 11 plays, 50 yards, 5:54. DET – Matt Prater 19-yard field goal, 12:33. Lions 20–3. Drive: 12 plays, 63 yards, 6:52. GB – Brett Hundley 1-yard run (Mason Crosby kick), 9:55. Lions 20–10. Drive: 7 plays, 78 yards, 2:39. DET – Marvin Jones 11-yard pass from Matthew Stafford (Matt Prater kick), 8:12. Lions 27–10. Drive: 4 plays, 75 yards, 1:46. DET – Matt Prater 31-yard field goal, 1:46. Lions 30–10. Drive: 10 plays, 33 yards, 4:21. GB – Jamaal Williams 1-yard run (Mason Crosby kick), 0:00. Lions 30–17. Drive: 6 plays, 75 yards, 1:42. Although the Packers came into the game off of a 15-day break, they played sloppily and lost to the Lions for only the second time at home since 1991. The Packers' solid opening drive was spoiled when kicker Mason Crosby's 38-yard attempt was blocked. The Lions scored touchdowns on two of their next three possessions as the Packers' Offense stalled with consecutive three and outs. Lions quarterback Matthew Stafford played an efficient game, registering two touchdowns with no interceptions, resulting in a 132.4 passer rating. In his second career start, Brett Hundley once again failed to attack the defense downfield or establish a comfortable pocket presence. He was sacked three times and failed to throw a passing touchdown for the second consecutive game. GB – Mason Crosby 40-yard field goal, 7:25. Packers 3–0. Drive: 11 plays, 70 yards, 4:37. CHI – Connor Barth 45-yard field goal, 2:21. Tied 3–3. Drive: 8 plays, 53 yards, 5:05. GB – Ty Montgomery 37-yard run (Mason Crosby kick), 11:49. Packers 10–3. Drive: 3 plays, 79 yards, 1:43. CHI – Connor Barth 44-yard field goal, 0:01. Packers 10–6. Drive: 10 plays, 39 yards, 1:37. GB – Mason Crosby 24-yard field goal, 10:20. Packers 13–6. Drive: 10 plays, 40 yards, 4:44. GB – Mason Crosby 50-yard field goal, 13:14. Packers 16–6. Drive: 10 plays, 26 yards, 4:20. CHI – Josh Bellamy 46-yard pass from Mitchell Trubisky (Connor Barth kick), 10:48. Packers 16–13. Drive: 4 plays, 70 yards, 2:30. GB – Davante Adams 19-yard pass from Brett Hundley (Mason Crosby kick), 5:37. Packers 23–13. Drive: 8 plays, 75 yards, 5:10. CHI – Connor Barth 49-yard field goal, 3:23. Packers 23–16. Drive: 8 plays, 49 yards, 2:10. Brett Hundley earned his first career win against rival Chicago Bears, finishing with one touchdown, no interceptions and a career high 110.8 passer rating. After failing to apply a solid pass rush in the previous two games, the Packers' Defense sacked Bears rookie Quarterback Mitchell Trubisky five times, with linebacker Nick Perry accounting for three. The Packers held Chicago's strong rushing attack to a mere 3.2 yards per carry. Packers' running backs Aaron Jones and Ty Montgomery left with knee and rib injuries, respectively, allowing rookie Jamaal Williams to see his first action in the NFL. Although only averaging 3.3 yards per rush, Williams ran well against a stout Chicago defensive front. In the second quarter, with Green Bay holding a 10–3 advantage, the Bears drove to Green Bay's 25-yard line and on third down and 13 Trubisky completed a short pass to running back Benny Cunningham that was first ruled down at the two yard line. Bears coach Jon Fox challenged the play, believing Cunningham reached the endzone, but upon review the officials determined that Cunningham lost the ball before stepping out of bounds, and in reaching for the pylon actually fumbled into the endzone. The resulting call was a touchback and Packers' ball at the 20-yard line. Although the Packers punted on the resulting possession, the reversal proved costly in a one score game. BAL – Justin Tucker 32-yard field goal, 15:00. Ravens 3–0. Drive: 10 plays, 47 yards, 4:51. BAL – Justin Tucker 39-yard field goal, 0:03. Ravens 6–0. Drive: 4 plays, 9 yards, 1:37. BAL – Mike Wallace 21-yard pass from Joe Flacco (Justin Tucker kick), 13:14. Ravens 13–0. Drive: 4 plays, 59 yards, 1:52. BAL – Justin Tucker 23-yard field goal, 4:50. Ravens 16–0. Drive: 5 plays, 24 yards, 1:57. BAL – Alex Collins 3-yard run (Justin Tucker kick), 2:17. Ravens 23–0. Drive: 1 play, 3 yards, 0:05. 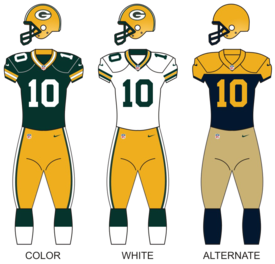 The Packers wore their alternative throwback uniforms for this game. For the first time in franchise history, the Packers lost to the Ravens at home. It was the second time in 11 years that the team was shut-out at home. After going the previous two games without a turnover, the Packers committed five: two fumbles and three interceptions. Brett Hundley threw three interceptions, including one in the end-zone on the team's opening drive, bringing his season interception total to seven, matching Rodgers' total from the entire 2016 regular season. Packers' rookie running back DeVante Mays fumbled on the first two carries of his career, losing one. Field position was key as the Ravens' special teams often kept the Packers starting drives deep in their own territory. PIT – Xavier Grimble 1-yard pass from Ben Roethlisberger, 8:19. Steelers 6–0. Drive: 12 plays, 59 yards, 6:46. GB – Randall Cobb 39-yard pass from Brett Hundley (Mason Crosby kick), 4:53. Packers 7–6. Drive: 6 plays, 60 yards, 3:29. GB – Jamaal Williams 54-yard pass from Brett Hundley (Mason Crosby kick), 1:33. Packers 14–6. Drive: 3 plays, 55 yards, 0:50. PIT – Martavis Bryant 17-yard pass from Ben Roethlisberger, (Two-point conversion, Antonio Brown pass from Ben Roethlisberger), 7:26. Tied 14–14. Drive: 5 plays, 65 yards, 2:51. GB – Davante Adams 55-yard pass from Brett Hundley (Mason Crosby kick), 12:17. Packers 21–14. Drive: 6 plays, 76 yards, 2:54. PIT – Antonio Brown 1-yard pass from Ben Roethlisberger, (Chris Boswell kick), 0:54. Tied 21–21. Drive: 6 plays, 53 yards, 3:25. PIT – Antonio Brown 33-yard pass from Ben Roethlisberger, (Chris Boswell kick), 8:50. Steelers 28–21. Drive: 7 plays, 68 yards, 4:14. GB – Jamaal Williams 4-yard run (Mason Crosby kick), 2:08. Tied 28–28. Drive: 12 plays, 77 yards, 6:40. PIT – Chris Boswell 53-yard field goal, 0:04. Steelers 31–28. Drive: 4 plays, 35 yards, 0:17. In one of the NFL's best games of 2017, Brett Hundley played his best game as a Packer. He threw two dimes to Cobb and Jamaal Williams for touchdowns. He would throw a third to Davante Adams on the opening drive of the second half. The Steelers and the Packers traded blows all game. Field position, which is something the Packers have struggled with in 2017, cost them the game. After a one-minute drive led to a punt, the Steelers drove 35 yards down the field in 17 seconds in the waning moments of the fourth quarter. Chris Boswell hit a career long 53-yard field goal as time expired. It was also his second consecutive game hitting a game winning field goal; he would do it again the next two weeks. The Steelers won the game 31–28. TB – Cameron Brate 28-yard pass from Jameis Winston (Patrick Murray kick), 9:58. Buccaneers 7–0. Drive: 10 plays, 75 yards, 5:08. GB – Mason Crosby 37-yard field goal, 2:34. Buccaneers 7–3. Drive: 14 plays, 61 yards, 7:22. GB – Jamaal Williams 1-yard run (Mason Crosby kick), 7:17. Packers 10–7. Drive: 5 plays, 45 yards, 2:32. GB – Dean Lowry 61-yard fumble return (Mason Crosby kick), 4:31. Packers 17–7. TB – Patrick Murray 36-yard field goal, 0:17. Packers 17–10. Drive: 12 plays, 57 yards, 4:04. TB – Patrick Murray 30-yard field goal, 14:33. Packers 17–13. Drive: 13 plays, 59 yards, 5:50. TB – Cameron Brate 11-yard pass from Jameis Winston (Patrick Murray kick), 6:06. Buccaneers 20–17. Drive: 12 plays, 78 yards, 7:02. GB – Mason Crosby 22-yard field goal, 2:03. Tied 20–20. Drive: 10 plays, 70 yards, 4:01. GB – Aaron Jones 20-yard run, 6:08. Packers 26–20. Drive: 8 plays, 72 yards, 4:01. The Packers had a 17–10 halftime lead, in large part to Lowry's defensive touchdown. Jameis Winston caught fire in the second half and gave the Buccaneers a 20–17 lead. Despite Brett Hundley only having 54 passing yards up to this point (37 on the Packers opening drive), he led the Packers down the field to tie the game at 20–20 with two minutes to play. The Packers started overtime with the ball, and Aaron Jones capped off the comeback win with a 20-yard touchdown run. Hundley would finish the game with 84 passing yards, and the Packers improved to 6–6. GB – Jamaal Williams 30-yard pass from Brett Hundley (Mason Crosby kick), 8:57. Packers 7–0. Drive: 11 plays, 74 yards, 6:10. CLE – Josh Gordon 18-yard pass from DeShone Kizer (Zane Gonzalez kick), 10:47. Tied 7–7. Drive: 7 plays, 84 yards, 4:05. CLE – Duke Johnson 7-yard pass from DeShone Kizer (Zane Gonzalez kick), 5:16. Browns 14–7. Drive: 12 plays, 70 yards, 6:58. CLE – Corey Coleman 2-yard pass from DeShone Kizer (Zane Gonzalez kick), 2:59. Browns 21–7. Drive: 9 plays, 88 yards, 4:31. GB – Jamaal Williams 1-yard run (Mason Crosby kick), 12:54. Browns 21–14. Drive: 13 plays, 75 yards, 4:59. GB – Davante Adams 1-yard pass from Brett Hundley (Mason Crosby kick), 0:17. Tied 21–21. Drive: 7 plays, 25 yards, 2:20. GB – Davante Adams 25-yard pass from Brett Hundley, 5:12. Packers 27–21. Drive: 6 plays, 42 yards, 3:23. The Packers were trailing the winless Cleveland Browns 14–7 in the third quarter. The Browns scored a touchdown to make it 21–7, but Hundley and the Packers responded with a touchdown drive of their own, making it 21–14. The Packers tied the game with 17 seconds left on a touchdown pass to Davante Adams. In overtime, Browns quarterback DeShone Kizer threw a costly interception to Josh Jones, and Adams took a screen pass to the end zone, improving the Packers record to 7–6 and setting the stage for Aaron Rodgers' comeback. CAR – Christian McCaffrey 7-yard pass from Cam Newton (Graham Gano kick), 6:02. Panthers 7–0. Drive: 15 plays, 85 yards, 7:35. GB – Davante Adams 13-yard pass from Aaron Rodgers (Mason Crosby kick), 0:04. Tied 7–7. Drive: 11 plays, 75 yards, 5:57. CAR – Graham Gano 33-yard field goal, 9:06. Panthers 10–7. Drive: 12 plays, 61 yards, 5:58. GB – Randall Cobb 33-yard pass from Aaron Rodgers (Mason Crosby kick), 0:39. Packers 14–10. Drive: 4 plays, 58 yards, 1:29. CAR – Greg Olsen 30-yard pass from Cam Newton (Graham Gano kick), 11:39. Panthers 17–14. Drive: 7 plays, 73 yards, 3:26. CAR – Damiere Byrd 18-yard pass from Cam Newton (Graham Gano kick), 7:28. Panthers 24–14. Drive: 7 plays, 49 yards, 3:28. GB – Mason Crosby 28-yard field goal, 1:27. Panthers 24–17. Drive: 12 plays, 47 yards, 3:51. CAR – Damiere Byrd 13-yard pass from Cam Newton (Graham Gano kick), 12:29. Panthers 31–17. Drive: 8 plays, 75 yards, 3:59. GB – Richard Rodgers 24-yard pass from Aaron Rodgers (Mason Crosby kick), 2:48. Panthers 31–24. Drive: 6 plays, 76 yards, 1:11. Aaron Rodgers returned to the field for the first time since being injured in Week 6. His three touchdowns, however, were negated by his three interceptions as the Panthers won 31–24 by a forced fumble in the game's final minute. With Atlanta beating Tampa Bay the next day, the Green Bay Packers were eliminated from the playoffs for the first time since 2008. Despite the return of Rodgers, he under performed. He threw 3 touchdown passes, but he also threw 3 interceptions and got sacked 3 times in the loss. MIN – Kai Forbath 49-yard field goal, 8:33. Vikings 3–0. Drive: 9 plays, 39 yards, 3:50. MIN – Stefon Diggs 4-yard pass from Case Keenum (Kai Forbath kick), 1:02. Vikings 10–0. Drive: 5 plays, 68 yards, 2:09. MIN – Kai Forbath 49-yard field goal, 8:33. Vikings 13–0. Drive: 12 plays, 62 yards, 6:12. MIN – Kai Forbath 27-yard field goal, 3:00. Vikings 16–0. Drive: 4 plays, 5 yards, 1:00. This Christmas edition of Sunday Night Football was anticipated to be a critical NFC North game before the season, however, with Aaron Rodgers back on IR and the Packers eliminated, the game did not live up to such standards. The Vikings played conservatively all night, and like the Ravens, won the game with expert field position and forced Brett Hundley to make mistakes. He threw two interceptions to Harrison Smith. The Packers were shut out twice at home in the same season for the first time since 2006, and their record dropped to 7–8. GB – Mason Crosby 41-yard field goal, 5:04. Packers 3–0. Drive: 8 plays, 45 yards, 3:58. DET – Matt Prater 28-yard field goal, 3:06. Tied 3–3. Drive: 5 plays, 64 yards, 1:57. DET – Kenny Golladay 54-yard pass from Matthew Stafford (Matt Prater kick), 7:35. Lions 10–3. Drive: 9 plays, 88 yards, 3:54. DET – Marvin Jones 3-yard pass from Matthew Stafford (Matt Prater kick), 2:24. Lions 17–3. Drive: 2 plays, 14 yards, 0:42. DET – Matt Prater 30-yard field goal, 0:35. Lions 20–3. Drive: 5 plays, 23 yards, 1:10. DET – Golden Tate 71-yard pass from Matthew Stafford (Matt Prater kick), 1:50. Lions 27–3. Drive: 1 plays, 71 yards, 0:12. GB – Randall Cobb 17-yard pass from Brett Hundley (Two-point conversion, Randall Cobb pass from Brett Hundley), 11:53. Lions 27–11. Drive: 8 plays, 75 yards, 5:11. DET – Ameer Abdullah 7-yard run (Two-point conversion, Golden Tate pass from Matthew Stafford), 7:23. Lions 35–11. Drive: 7 plays, 59 yards, 6:11. The Packers were swept by the Lions for the first time since 1991. With this loss, Green Bay lost 3 straight games to close out a disappointing season with a 7-9 record, their first losing season since 2008. ^ "Packers' Geronimo Allison: Staying in Green Bay for 2017". cbssports.com. March 6, 2017. ^ "Packers re-sign T/G Barclay". packers.com. March 10, 2017. ^ "Raiders agree to terms with Jared Cook on 2-year deal". nfl.com. March 16, 2017. ^ "Raiders add three free agents". Raiders.com. July 14, 2017. Retrieved July 15, 2017. ^ "Packers re-sign LB Elliott". packers.com. March 14, 2017. ^ "Packers sign LS Brett Goode". packers.com. August 12, 2017. ^ "Bills sign ex-Packers DB Micah Hyde to five-year deal". NFL.com. March 9, 2017. ^ "Packers' Don Jackson: Tendered by Packers". cbssports.com. March 8, 2017. ^ "Ex-Green Bay Packers 1st Rounder Datone Jones Signs Minnesota Vikings". ESPN.com. March 14, 2017. ^ "Green Bay Packers re-sign fullback Joe Kerridge". Green Bay Packers. Retrieved March 16, 2017. ^ "Eddie Lacy agrees to terms with Seahawks". NFL.com. March 14, 2017. ^ "Detroit Lions sign guard T.J. Lang to three-year deal". NFL.com. March 12, 2017. ^ "Packers re-sign Michael". packers.com. March 23, 2017. ^ "Julius Peppers returning to sign with Carolina Panthers". NFL.com. March 10, 2017. ^ "Packers re-sign LB Nick Perry". packers.com. March 9, 2017. ^ "Report: Packers to re-sign DT Christian Ringo". gnb.247sports.com. March 7, 2017. ^ "Packers re-sign P Jacob Schum". packers.com. March 8, 2017. ^ "Report: Packers to re-sign LB Joe Thomas". gnb.247sports.com. March 7, 2017. ^ "Browns agree to terms with OL JC Tretter". ClevelandBrowns.com. March 9, 2017. ^ "Packers sign House, re-sign Tripp". packers.com. March 15, 2017. ^ a b "Packers sign LB Brooks, claim LB Odom, place OL Barclay on IR". packers.com. September 3, 2017. Retrieved September 3, 2017. ^ "Packers sign TE Martellus Bennett". packers.com. March 10, 2017. ^ "Packers sign TE Lance Kendricks". packers.com. March 11, 2017. ^ "Davon House returning to Packers on one-year deal". nfl.com. March 14, 2017. ^ "Packers sign DT Jean Francois". packers.com. March 24, 2017. ^ "Packers sign G McCray". packers.com. March 29, 2017. ^ "Packers sign LS Hart". packers.com. March 31, 2017. ^ "Packers sign G Jahri Evans". packers.com. April 26, 2017. ^ a b c d e f "Packers sign five draft picks, 15 rookie free agents". packers.com. May 5, 2017. ^ "Packers sign five tryout players from rookie orientation". packers.com. May 8, 2017. ^ a b c "Packers sign RB Jamaal Williams, release P Jacob Schum". packers.com. June 1, 2017. ^ a b "Packers sign T Robert Leff". packers.com. June 6, 2017. ^ a b "Packers sign CB Daquan Holmes". packers.com. June 7, 2017. ^ "Packers sign TE Emanuel Byrd". packers.com. August 5, 2017. ^ "Packers claim DE Shaneil Jenkins". packers.com. August 13, 2017. ^ "Packers sign DT Calvin Heurtelou". packers.com. August 21, 2017. ^ a b "Packers sign DT Quinton Dial". packers.com. September 5, 2017. ^ a b "Packers sign G/T Adam Pankey to active roster, G Darrell Greene to practice squad". packers.com. September 13, 2017. ^ "Packers sign DT Ricky Jean Francois". packers.com. September 21, 2017. ^ "Packers sign RB Joel Bouagnon". packers.com. January 10, 2018. ^ a b "Packers release two running backs". packers.com. May 1, 2017. ^ "Packers release DT Guion". packers.com. August 8, 2017. ^ "Packers release DE Jenkins". packers.com. August 15, 2017. ^ "Packers release three players". packers.com. August 28, 2017. ^ "Packers announce roster moves to reduce roster to 53". packers.com. September 2, 2017. Archived from the original on 2017-09-03. Retrieved 2017-09-03. ^ "Packers move WR Geronimo Allison to active roster". packers.com. September 12, 2017. ^ "Packers waive TE Martellus Bennett". packers.com. November 8, 2017. ^ "Packers sign CB King". packers.com. May 11, 2017. ^ "Packers sign S Jones". packers.com. May 19, 2017. ^ "Packers sign DT Montravius Adams". packers.com. July 5, 2017. ^ "Packers sign LB Vince Biegel". packers.com. May 31, 2017. ^ "Packers' 2017 preseason opponents announced". packers.com. April 10, 2017. ^ "Packers announce 2017 schedule". packers.com. April 20, 2017. ^ "NFL.com Statistics". NFL.com. September 10, 2017. Retrieved September 10, 2017. ^ "Packers WR Davante Adams named to Pro Bowl". packers.com. Retrieved January 16, 2018. ^ "2017 All-Pro Team". Associated Press. January 5, 2018. Retrieved Jan 5, 2018. ^ "Packers DT Mike Daniels named to Pro Bowl". packers.com. Archived from the original on 2018-01-10. Retrieved January 9, 2018. ^ "AFC & NFC Players of the Week – Week 5". NFL Communications. Retrieved October 11, 2017. ^ "AFC & NFC Players of the Week - Week 13". nflcommunications.com. Retrieved December 6, 2017. ^ "AFC & NFC Players of the Week - Week 14". nflcommunications.com. Retrieved December 13, 2017. This page was last edited on 18 January 2019, at 03:15 (UTC).